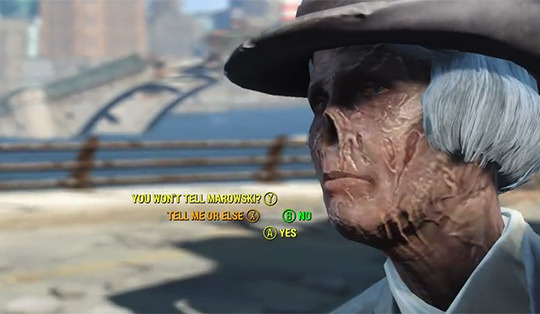 WARNING: This post "spoils" an early quest in Fallout 4 and a later quest in Fallout 3. The "Diamond City Blues" quest, one of the better quests of Fallout 4, begins at an upper-class bar in Diamond City. Most of the bar patrons are snooty rich one-percenter caricatures who will categorically refuse to talk to poor people like you, even though you're richer than God and they literally sleep on filthy mattresses in trash shacks, so you basically kind of hate these people from the beginning. Over at the bar counter, a woman is drinking to forget her unhappy marriage, while the grizzled bartender-owner dude implies he's having an affair with her. Suddenly, her weak jealous husband tries to confront the two but he ends up getting humiliated. The game really doesn't want you to kill the bartender. The husband doesn't want to kill anyone, and the conversation gives you many opportunities to let the bartender explain himself. The bartender offers a deal: go with him to his scheduled mafia drug deal and help him kill everyone, and you can have some of the money / drugs as payment to you and cuckold-restitution to the husband. If the husband isn't there and you confront the bartender alone, then the husband won't know about any of this, and later takes ownership of the bar. If the bartender dies, you'll find a note on his body that details the drug deal anyway. (The game really wants you to go to this drug deal.) If the husband wasn't there, you can still tell him about the note and involve him. If the husband is there, he will agree for a cut of the contraband. The fight is not trivial. It is two named NPCs and their henchmen, about as much work as clearing an entire enemy base. As a reward, you get 1000 bottlecaps and x50 of each basic drug, which is a lot! 1000 bottlecaps is maybe what you'd get from selling all your equipment, and most kill-stuff quests will pay out 100-200 bottlecaps on average. 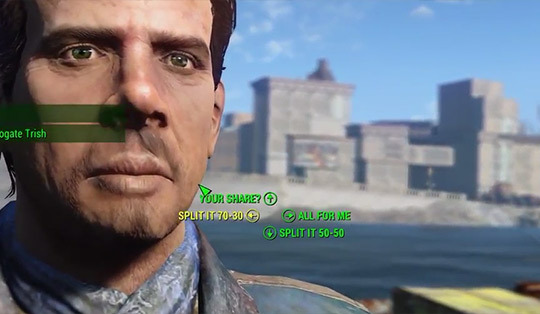 Also, 50 of each drug is more than you'd pick up across 10-20 hours of playing Fallout 4. This is an unusually big quest reward. Make him take nothing. He'll whine about having been screwed for his entire life, and he hopes you suffer for this betrayal. This is kind of mean, and I imagine a lot of players will fear their companion will disapprove strongly of this option. Agree to the 50-50 split. He will say "this seems fair to me," but most players will think this is really unfair -- he's a weak fighter who barely did anything in the fight AND he's lucky you even brought him in on it. 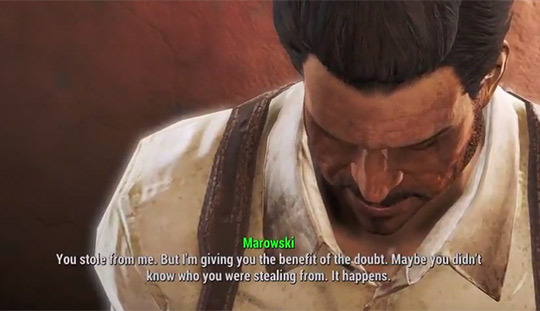 So now the husband is not only arguing for a share of the quest reward for his own damn quest, but he's also aware of Fallout 4's terrible inventory UI and annoying vendor-barter system, and wants to humiliate me with it? At this point, I shot him in the face, but pretend I didn't. After the ambush, the mafia lieutenant begs for mercy. If you let her live, she will tell you about the secret mafia drug lab. She says they'll kill her if they find out she told you, so that's why she won't rat you out to the mafia. If you promise to let her live, she will tell you the secret password too. If the bartender is alive, then he will try to kill her anyway because he wants no possibility of any mafia witnesses. So now the quest enters a third stage, telling you to travel far across the game map and fight through a lot of zombies and then solve a puzzle to get into the secret mafia drug lab. It feels like it's going to be an epic finale... but the reward is relatively nothing, just a few more drugs and some random items. Look at what your greed got you! At this point, you hear some triumphant music play and the quest is now over. What the hell? 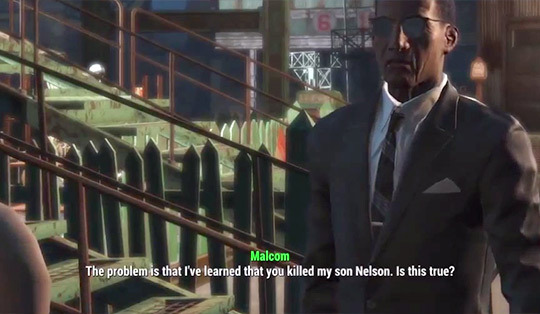 The game never says, "haha the mafia lieutenant was lying," and this disappointing payoff was probably a fluke on the part of an overworked Bethesda level designer. But from a narrative perspective, she was clearly lying to try to save her own skin, and telling you whatever you wanted to hear... Or is it a bug? Is the quest over now? That lingering ambiguity and doubt and disappointment -- usually nonexistent in most AAA design, by the way -- is what makes this quest unusual. Plus, the quest actually keeps going. After a few in-game days, the consequences of all your actions keep playing out, with even more options and opportunities to screw people over. You can negotiate him down to 1000 bottlecaps. You can beg for a week to try to get the money together. If the rich son died, the father will ask if you know who killed his son. If he thinks the mafia did it, he will pay you to kill the mafia boss. If he thinks you're lying and you did it, he'll send thugs after you, or make you pay him a lot of money to stop. You can also implicate the husband. If you tell her the husband did it, she will kill the husband. If the husband is still alive, he will get nervous that she'll find out about everything, and want to get rid of her. You can tell him to do it, or you can offer to do it. If you made him take the 70-30 split, then he'll tell her you did it, and she'll try to kill you. If you blame her for sleeping with the bartender, and imply that this is all basically her fault, she'll snap back at you: "don't judge me, you murderer." If you tell her about the husband, she will (after a week) give you a photo that incriminates the mafia boss and the rich family. You can use this photo to pay-off your debt to the mafia or the family... and with her, the quest is finally over... or is it? Yeah, it's finally over. As far as I can tell. What I like about this quest is that it's a "slow quest" that actually does the work of world simulation over the course of several in-game days. Imagine completing this quest by raiding the mafia drug lab, then doing some other unrelated quests for a few real-life hours, and then suddenly all these NPCs are wondering what the hell happened. In most RPGs, NPCs accept NPC deaths with supernatural stoicism and everything is instantly resolved. In this quest, stuff keeps happening. It reminds me of the complex Tenpenny Tower quest from Fallout 3, where you can convince wealthy humans and sentient zombies to peacefully coexist, but if you revisit the location days later then you'll find out the zombies eventually killed all the humans anyway. 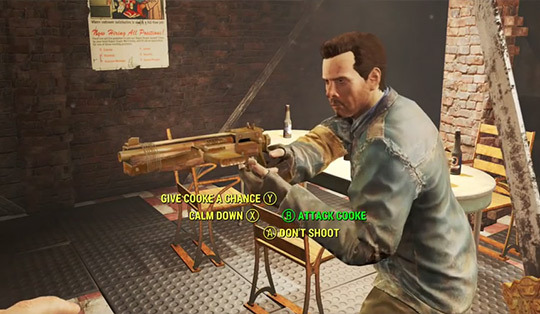 Diamond City Blues also plays with Fallout 4's game systems in critical ways. An NPC basically admits the game's inventory UI and barter systems are annoying, then uses that to negotiate with you. The Quest UI lies to you and says the quest is over, waits a few days, then ropes you back into everything. It's also a bit difficult to kill the mafia boss or rich father, once they start sending thugs to murder you. To the game's faction system, these NPCs are still safely non-hostile in the city, and the entire city will attack you if you attack them to their face. 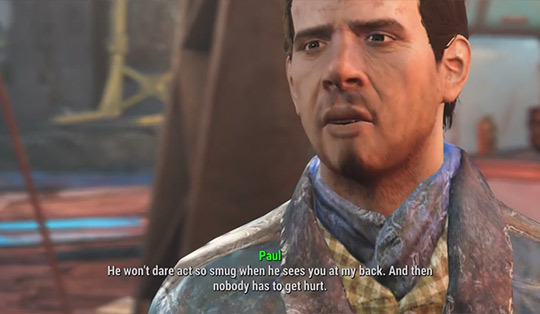 They have a strange sort of "invincible passive-aggressive NPC privilege" here which is really fascinating, the game is systemically fortifying organized crime and the rich who can just spawn NPCs to go hostile after you, instead of getting their hands dirty. Notice that there's no "big choices" here. You can't go to the cops at any point in this quest, because in a pulpy noir crime parable that never happens. It will all pretty much play out the same way, no matter what, and it's rigged to do that. What's different is the details in how these consequences spill over everywhere. You can lie to so many people about everything! NPCs actually have some concept of memory, interiority, and autonomy! Instead of being a clear branching narrative with a big eye-rolling "ethical dilemma" at the end, this is bushy and mushy. The result is a very expressive quest that drags more and more characters into the orbit of this messy noir drama, haunting everyone with their complicity and lies, including the player. One of the few open world quests that actually needs an open world to pull it off.